We’ve had our tree up for a week and it is so damn dry already that I’m concerned to even turn the lights on that are strung across its quickly drooping, dried branches. 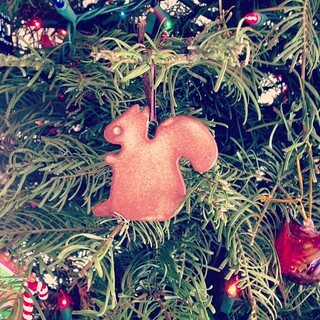 I was even more concerned that we did not have a squirrel ornament to hang on said crunchy, almost dead branches. Etsy has everything, you guys. We had a faux pre-lit tree for years, but the lights quit working on it last year so we switched to real. Faux tree pro: It doesn’t die ten minutes within setting it up and doesn’t shed. Faux tree con: It’s fake and does not smell like holiday cheer. Real trees or fake trees? since this this web page conations really fastidious funny data too. suggesting that I actually enjoyed the standard info an individual supply to your guests? My spouse and i have been more than happy Ervin managed to finish off his investigations via the ideas he acquired using your web pages. It’s not at all simplistic to just happen to be offering secrets that many others have been making money from. And we see we now have the website owner to appreciate for that. These illustrations you have made, the simple website menu, the friendships you can aid to instill – it’s most fantastic, and it is letting our son and our family reason why that topic is pleasurable, which is incredibly important. Thank you for everything! This site can be a stroll-through for the entire info you needed about this and didn抰 know who to ask. Glimpse here, and you抣l undoubtedly discover it. I wish to express thanks to the writer for bailing me out of this type of trouble. Right after surfing throughout the internet and coming across thoughts which are not productive, I thought my life was done. Being alive minus the solutions to the issues you’ve solved as a result of this article is a serious case, and ones which might have adversely affected my career if I hadn’t noticed your website. Your own personal skills and kindness in handling almost everything was helpful. I don’t know what I would’ve done if I hadn’t encountered such a point like this. I’m able to now relish my future. Thanks a lot so much for the specialized and amazing guide. I will not think twice to refer the website to any individual who needs assistance about this problem. Fine way of describing, and fastidious post to take facts about my presentation focus, which i am going to convey in institution of higher education.